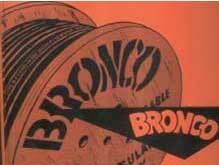 The BRONCO-66 cable line was originally developed in the 1940’s, and the BRONCO trade name came to be synonymous with exceptional quality. PHILATRON is a direct descent of the individuals who originally developed BRONCO cables. With over 80 years of expertise in flexible power cables PHILATRON has embraced the concept of advancing state-of-the-art in wire, cable and a whole series of innovative new products meeting current and projected market demands in a wide range of industries. As the technology of wire and cable has been refined over the years, PHILATRON is proud to introduce a whole new series of cables superior to BRONCO 66 cables. In today’s world of global activities, applications of cables in any climate is critical to the integrity of your electrical system. If the cable fails your system fails. The cables you install to power your systems must be capable of withstanding environmental abuses of abrasion, heat, cold, petroleum, chemicals, and harsh handling. PHILATRON’s cables are designed to meet the challenges of your system anywhere in the world. These cables are extraordinarily tough with superior conductor’s insulation and outer protecting jacket which exhibits the best physical properties in the industry. Our Mining Cables and Portable Power Cables are made of PHILAFIN™ , PHILATRON’s exclusive proprietary cross-linked polyolifin advanced synthetic rubber, that gives maximum protection from oil and other petroleum products, corrosive chemicals, ozone, flame, ultraviolet rays, abrasion, cutting, and crushing. Our cables gives you excellent flexibility and superior operating temperature ranges from +125°C to -65°C. PHILATRON’s value-to-cost ratio is very high. Our cables are intended for users who require maximum dependability with minimum replacement and down-time expenses. PHILATRON cables are engineered and manufactured to meet the applicable specifications of ASTM (American Society for Testing Materials), CSA (Canadian Standard Association), ICEA (Insulated Cable Engineers Association), MIL SPECS (US Military), MSHA (Mine Safety and Health Administration), NEC (National Electric Code), NEMA (National Electrical Manufacturers Association), OSHA (Occupational Safety and Health Administration), and UL (Underwriters Laboratories).